So I’m chuffed to have been nominated as a versatile blogger by Mschristiner, Worldly Winds and Get Set and Go! Thank you all! Although I’m only relatively new to the world of blogging, I’ve quickly become immersed in the culture of sharing ideas, swapping pleasures, learning about all the wonderfully enjoyable places, people and personalities out there in the www. There is so much potential for everyone to become closer, and for our minds to expand further. It seems there are some obligations associated with this nomination gig… which is a great opportunity to share the love. I love pickles. They are happiness in a food. I am reading Ox Travels at the moment. It is a collection of short travel stories from contributors across the world… all in the aid of Oxfam. I think dancing in the kitchen while cooking dinner is one of the best ways to shake off the worries of the day. I am a really big Michael Palin fan!! My favourite documentary mini-series is Full Circle. I dream of one day having a library reminiscent of the one in Disney’s Beauty and the Beast – rolling ladder and all. 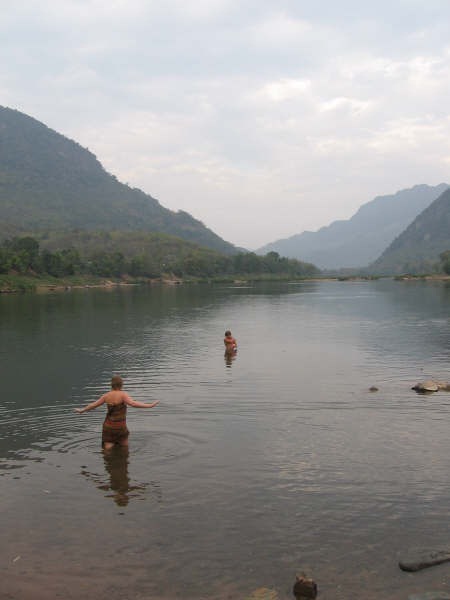 One of my favourite travel moments was bathing in the Nam Ou in Laos – oh the serenity. I think red is a very good colour. I adore many more than 10-15 blogs, and have listed some of my favourites in my links to enjoyable things and Travel around the world from inside a computer. But…. here is a list of blogs that I think best fit the description of ‘versatile’. Our Oyster is a travel blog by James and Jade. It is a beautifully clean, crisp site that features tips, stories and inspiration about the world. Go Pantone is a freestyle blog about art, culture and fun things – it brings colour to my day and is full of surprises. Wandering Earl really is an inspirational travel blog. Earl has been wandering for many years budget-style, earning his tag of ‘permanent nomad’. He recently did a Eurail adventure and is now in Africa. What Rhymes with Chaos? by Brisbane writer and all-‘round arty personality, Josh Donellan, is a blog hosting rant mail to big-name companies, Brisbane music reviews and general social / cultural commentary. All good, funny stuff. A little Adrift is a brilliant travel resource. Complete with travel tales, budget spread sheets, packing lists and place info, Shannon has created a great one-stop site for those interested in RWT travel. I love her organised yet liberated approach to the world of travel. 365 White Ribbon is a blog on a mission for change. Blogger Imogen talks about violence against women and other important things to do with life and society. Even with its very serious subject matter, this blog is ace at being sincere, fun and relevant. Tchotchkes etc. is a blog about trinkets, chooks and hydrangeas (among other very lovely things). It emphasises the joy of home and is a nice, grounding read when I am missing the world of travel. Beers and Beans combines photography and travel into one joyful little package. Very much up there with the best. They also have a beautiful e-book (in easy-peasy language) about how to be a manual photography extraordinaire. 2 Backpackers is another site that serves as a great resource. It has a bit of everything – photography, stories, tips. The Bookery Cook is a blog about loving food and art. Very real, very yummy, very pretty. Hope you enjoy some of the blogs I enjoy. Please share some of your favourite links that you think others will love too. I certainly hope so! Thanks again! Thank you so much for nominating me!! I will try to get a post up like this soon!